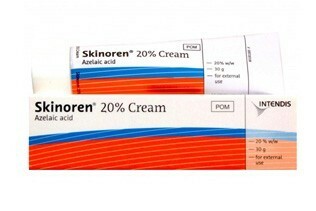 Skinoren is a cream that attacks the bacterium called Propionibacterium acnes which causes acne. Skinoren also decreases growth of harder skin cells that block the pores. Effect: attacks bacterium called Propionibacterium acnes. Unblocks pores that cause black- and whiteheads.